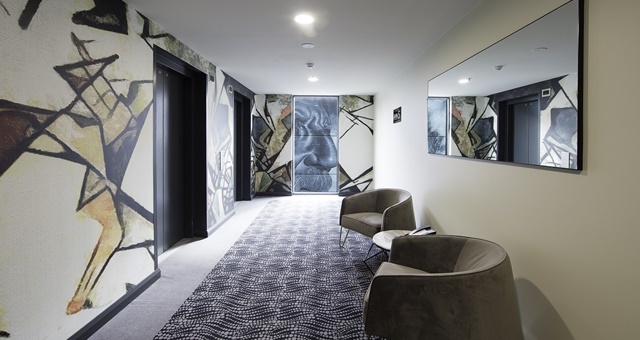 Modern artworks have been applied to the walls as part of Novotel Geelong’s major refurbishment. Novotel Geelong has taken the wraps off a full top-to-toe renovation which saw over $3.5 million spent on the property’s first full refurbishment and upgrade since its 2001 opening. The four-star hotel owned by the Erdi Group is looking as good as new with a fresh, coastal-inspired and modern paint scheme applied to all rooms and public areas. In addition, the hotel has received new carpets, curtains, smart TV’s and furnishings in all rooms, along with new chaise lounges and even a feature wall in the lobby. Bathrooms in each room have also been modernised with a fresh, functional look. The process was an extensive one, with one floor at a time locked off for work in order to ensure noise and guest disruption was kept to a minimum. Planning for the project took more than two years to ensure all works were carried out without incident. The hotel’s pre-loved furniture was donated to local men’s and women’s shelters and support services Samaritan House Geelong and Foundation 61. Located right on the Geelong waterfront, Novotel Geelong property manager Bryan Dennis said the renovations were partially inspired by the city’s street art, which consists of 3D and augmented reality wall murals. “Inspiration for the multimillion-dollar renovation was taken from Geelong’s landscape and surroundings. The ocean is reflected throughout the refurbishment and has been influential in our selection of colour, furnishings and décor,” Dennis said.